Shanahan divested his Boeing financial interests prior to serving as deputy. When Shanahan transitioned to the Pentagon as then-Defense Secretary James Mattis' deputy in 2017, he said he divested his financial interests related to Boeing and signed an ethics agreement barring him for participating in Boeing-related activities -- as is typical for government officials transitioning from the private sector. (Pablo Martinez Monsivais/Pool via Reuters) Acting Secretary of Defense Patrick Shanahan speaks to members of the media aboard a military plane prior to his arrival at Andrews Air Force Base, Md., Feb. 23, 2019. American Oversight charged that the Pentagon failed to respond to four Freedom of Information Act (FOIA) requests for information relating to Shanahan's ties to Boeing. The lawsuit is now seeking: "Communications between Shanahan and other political appointees and anyone at Boeing, including CEO Dennis Muilenburg;" "Communications between Shanahan and DOD ethics officials about Shanahan’s past employment at Boeing;" "Ethics recusals, determinations, authorizations, or waivers regarding Shanahan’s involvement in Boeing-related matters;" and "Shanahan’s calendar entries." 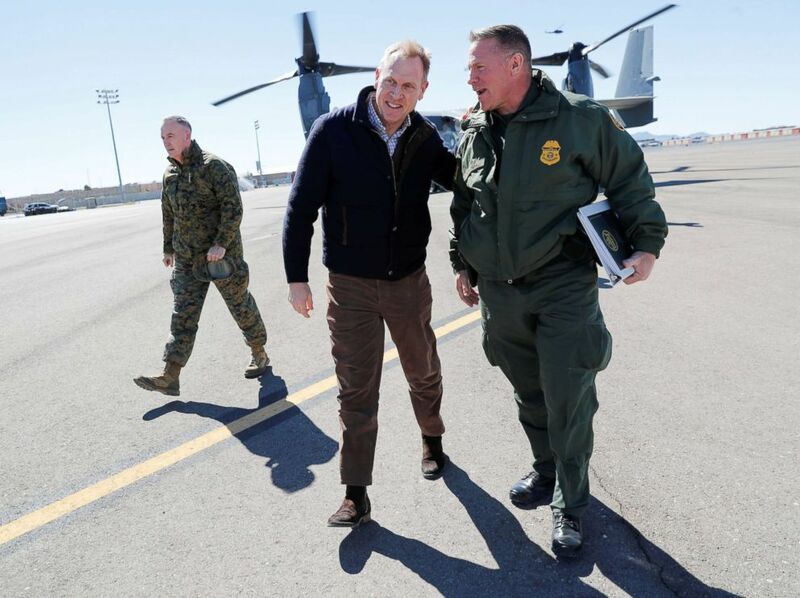 (blo Martinez Monsivais/Pool via Reuters) Acting Secretary of Defense Patrick Shanahan, center, talks with El Paso Sector Chief Aaron Hull, right, as they walk across the tarmac at El Paso International airport after doing a Osprey aircraft tour of the U.S.-Mexico border, Feb. 23, 2019 in El Paso, Texas. Joint Chiefs Chairman Gen. Joseph Dunford is at left. "We are aware of the FOIA request submitted by American Oversight and are responding appropriately," Lt. Col. Joseph Buccino, Shanahan's spokesperson, told ABC News on Wednesday. 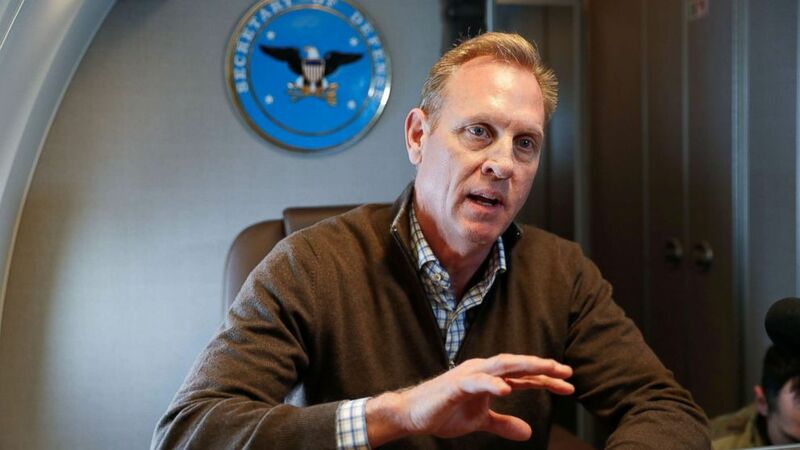 "Secretary Shanahan has at all times remained committed to complying with his Ethics Agreement, which includes a screening arrangement that ensures Boeing matters are referred to another appropriate DoD official." Boeing declined a request to comment from ABC News. American Oversight pointed to a January report from Politico that Shanahan had praised Boeing and criticized its defense industry competitors in private conversations during his time at the Pentagon. During the Trump administration, Boeing has been at the center of several high-profile contracts, including a $3.9 billion deal for a new Air Force One that President Donald Trump personally helped to negotiate. In December, Foreign Policy reported that Boeing's F-15s were being "forced" on the Air Force, instead of the Lockheed Martin's new F-35s. Both Politico and Foreign Policy reported that Shanahan had privately disparaged the F-35 program. Boeing has not returned a request for comment by ABC News. Shanahan assumed the role of acting Secretary on Jan. 1 after Mattis resigned. Shanahan has now served as the longest "acting" Defense Secretary in history and nobody has been nominated to fill the position. "Acting Secretary Shanahan should be running the Pentagon as a government official concerned with protecting the country, not as a former defense contracting executive," said Austin Evers, executive director of American Oversight. "In light of the possibility that the acting secretary might fill his role permanently, it’s vital that the public know whether Shanahan is allowing business allegiances to play a role in his management of America’s armed forces." American Oversight has filed more than 70 public record lawsuits investigating the Trump administration since their founding in March 2017, according to their website.